Grantland was a sports and pop-culture blog owned and operated by ESPN. It was started in 2011 by veteran writer and sports journalist Bill Simmons, who remained as editor in chief until May 2015. Grantland was named after famed 20th century sportswriter Grantland Rice (1880-1954). On October 30, 2015, ESPN announced that it was ending the publication of Grantland. 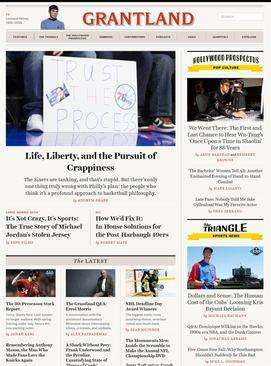 The site featured contributions from Simmons alongside other sports and pop-culture writers and podcasters including: Holly Anderson, Mallory Rubin, Katie Baker, Bill Barnwell, Rembert Browne, Andy Greenwald, Bryan Curtis, Kirk Goldsberry, Steven Hyden, David Jacoby, Jonah Keri, Chuck Klosterman, Molly Lambert, Mark Lisanti, Zach Lowe, Robert Mays, Davy Rothbart, Sean McIndoe, Brian Phillips, Charles P. Pierce, former NBA player Jalen Rose, Shea Serrano, Andrew Sharp and Mark Titus. Former contributors include Men in Blazers duo Roger Bennett and Michael Davies, Tom Bissell, Lane Brown, author Dave Eggers, author Malcolm Gladwell, Justin Halpern, Mark Harris, Jay Caspian Kang, screenwriter of the movie Rounders Brian Koppelman, Juliet Litman, Pulitzer Prize-winning journalist Wesley Morris, Chris Ryan and MacArthur Award-winning novelist Colson Whitehead. In May 2015, ESPN's President John Skipper told the New York Times that ESPN would not be renewing Simmons' contract, effectively ending Simmons' tenure at ESPN. Later in the month, Chris Connelly was announced as interim editor-in-chief. An article written by Caleb Hannan and published on the Grantland website in January 2014 received considerable criticism from the transgender community. Hannan's article was about the Oracle GXI golf putter and its creator, Essay Anne Vanderbilt, referred to as Dr. V. It treated Vanderbilt's transgender identity in the same manner as a number of scientific qualifications that Vanderbilt had fraudulently claimed to hold, suggesting that Hannan considered Vanderbilt's gender identity to be untruthful as well. Before the article was published, Vanderbilt committed suicide. After initially dismissing all criticisms and drawing even more fire, Grantland's editor-in-chief Bill Simmons published a response to the criticism, acknowledging errors made by Grantland and Hannan, including Hannan's outing of Vanderbilt to one of her investors and Grantland's "collective ignorance about the issues facing the transgender community in general, as well as our biggest mistake: not educating ourselves on that front before seriously considering whether to run the piece". A profile of Simmons in Rolling Stone, published in April 2014, lambasted him at length over the Dr. V matter and incorporated criticism from senior ESPN personnel, but also included Simmons' defenses and disagreements with some of the harsher criticisms of the article. On Friday October 30, 2015, ESPN officially announced the shut down of Grantland: “After careful consideration, we have decided to direct our time and energy going forward to projects that we believe will have a broader and more significant impact across our enterprise.”  The closing of Grantland was met with harsh criticism of ESPN, from both former writers of Grantland and admirers of the site. Former Editor-in-Chief Bill Simmons called the shut down “simply appalling.” ESPN president John Skipper said the decision to shut down the site was not a financial matter and instead was done because ESPN did not see the value in spending the time and energy necessary to continue the excellence of Grantland. Grantland's closure was seen by many as another blow against long-form journalism. Huffington Post writer Justin Block writes, “In an era ruled by bite-sized content and dumbed-down click-bait journalism, Grantland's defining characteristic came at odds with sustainable finances.” Grantland's articles were often long form and usually not instant but measured reactionary pieces, a trend not common in today's media landscape. Grantland was considered by some to be the highest-quality work under the umbrella of ESPN and received critical acclaim, but its financial success has been widely debated. Grantland received 6 million unique visitors in March 2015, a number that some people believed could not support a staff of 50 writers, editors and IT personnel. The shutdown was also coming at a time of relative financial uncertainty for ESPN. In September 2015, ESPN laid off 300 employees or approximately 5% of its workforce. It has also been widely reported that in 2015 ESPN lost 3.2 million subscribers due to consumers abandoning traditional cable packages. Grantland was known for its long-form journalism and award-winning writing. Its sports journalism pieces often had a strong focus on sports analytics and data analysis, referencing and pulling data from sites like Football Outsiders, Baseball Prospectus, Synergy, and ESPN. Grantland wove statistics into part of the story and made the analytics understandable to the average sports fan. As Stephen Carter from the Chicago Tribune put it, "This was sportswriting for grownups." These pieces would also often include a data visualization representation. Some have concluded that Grantland's closure represents a trend in today's media business that unless you are one of the biggest web properties or smallest one-person “micro sites” it's tough to be economically viable. Simmons has announced a new media venture, The Ringer, which, like Grantland, will focus on sports and pop culture. A number of former Grantland employees, including Sean Fennessey, Chris Ryan, Mallory Rubin, Juliet Litman, Craig Gaines, Bryan Curtis, Ryan O'Hanlon, Danny Chau, Riley McAtee, Joe Fuentes, and Tate Frazier have joined the new venture. Additionally, Simmons has launched a podcasting network, featuring shows re-purposed from the Grantland network, including The Watch with Ryan and television critic Andy Greenwald and his own podcast The Bill Simmons Podcast. Ryan and Greenwald will also host a Game of Thrones re-cap show on HBO modeled after their Grantland podcast "Watch the Thrones" and produced by Simmons. ↑ Crupi, Anthony (June 9, 2011). "Bill Simmons on Launch of Grantland.com and How Sponsors Will Keep the Site Free". Adweek. Retrieved October 31, 2015. 1 2 "ESPN Statement Regarding Grantland". ESPN MediaZone. Retrieved October 31, 2015. ↑ Guthrie, Marisa. "ESPN President John Skipper on Bill Simmons: "It Was Business"". Hollywoodreporter.com. Retrieved June 21, 2015. ↑ Chase, Chris. "Bill Simmons will be replaced at Grantland by Chris Connelly". Ftw.usatoday.com. Retrieved October 31, 2015. ↑ Levin, Josh (January 19, 2014). "Digging Too Deep". Slate.com. Retrieved October 31, 2015. ↑ Klinger, Lauren; McBride, Kelly. "Lessons learned from Grantland's tragic story on Dr. V". Poynter.org. Retrieved October 31, 2015. ↑ Kahrl, Christina (January 20, 2014). "What Grantland Got Wrong". Grantland.com. Retrieved October 31, 2015. ↑ Hannan, Caleb (January 15, 2014). "Dr. V's Magical Putter". Grantland.com. Retrieved October 31, 2015. ↑ Simmons, Bill (January 20, 2014). "The Dr. V Story: A Letter From the Editor". Grantland.com. Retrieved October 31, 2015. ↑ Tannenbaum, Rob (April 29, 2014). "Bill Simmons' Big Score". Rolling Stone. Retrieved October 31, 2015. ↑ "ESPN Shutters Grantland, Effective Immediately". Vanity Fair. Retrieved December 1, 2015. ↑ "Vanity Fair". Vanity Fair. Retrieved December 1, 2015. ↑ "ESPN Closing Grantland Is The Dumbest 'Smart' Business Decision". The Huffington Post. Retrieved December 1, 2015. 1 2 3 Reed, Jon. "The fall of ESPN's Grantland – an enterprisey take". Digimonica. Retrieved December 1, 2015. ↑ Bonesteel, Matt (2015-10-22). "ESPN layoffs will gut the network's production staff". The Washington Post. ISSN 0190-8286. Retrieved 2016-02-03. ↑ "ESPN's Problems Are of Its Own Making -- The Motley Fool". The Motley Fool. Retrieved December 1, 2015. ↑ Hobson, Will; Bonesteel, Matt (October 30, 2015). "ESPN shuts down Grantland months after parting ways with Bill Simmons". The Washington Post. ISSN 0190-8286. Retrieved December 1, 2015. 1 2 "Oh ESPN, why did you have to kill Grantland?". chicagotribune.com. Retrieved December 1, 2015.